Nestled on a tropical island in the Noonu Atoll, Maldives, Sun Siyam Iru Fushi is a luxurious lodge that is truly inspired by its phenomenal surroundings. 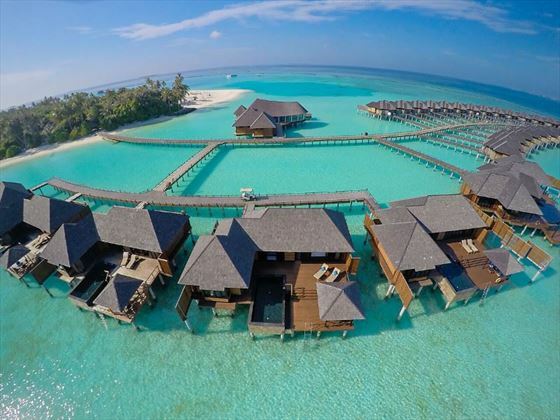 From the water villas that jut out into the azure lagoon, to the thatched roofs and bright airy décor, this resort is a true Indian Ocean oasis. There are many villas and retreats to choose from. 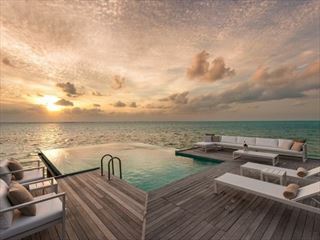 The cool Beach Villas are perfect for small families and the Sunset Horizon Water Villa offers the most incredible views of the sun setting, whilst the Celebrity Retreat offers luxurious amenities such as a swimming pool, three bedrooms and a billiards room for a party of up to 10. After a day full of water sports and lazing in the pool with friends and family, there are a myriad of fantastic restaurants serving a range of delicious cuisines from around the globe. Islander’s Grill serves up a delectable spread of grilled seafood, whilst Flavours is a brilliant French fine dining restaurant positioned above the lagoon. The Spa by Thalgo is certainly a treat you won’t want to miss. Inspired by its natural surroundings, you’ll be sure to feel serenity and tranquillity after a massage here. 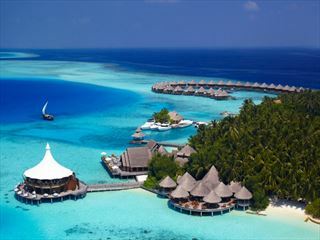 Voted Best Spa Hotel in Maldives at the International Hotel Awards. 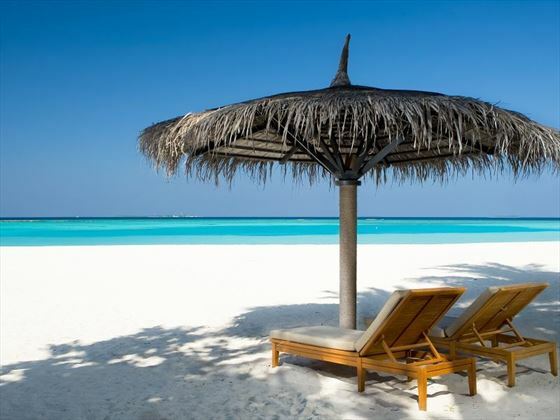 The Sun Siyam Iru Fushi has a No Drone policy, due to the safety and privacy for guests, employees and resort property, the resort prohibits the operation of unmanned aerial systems, or drones. 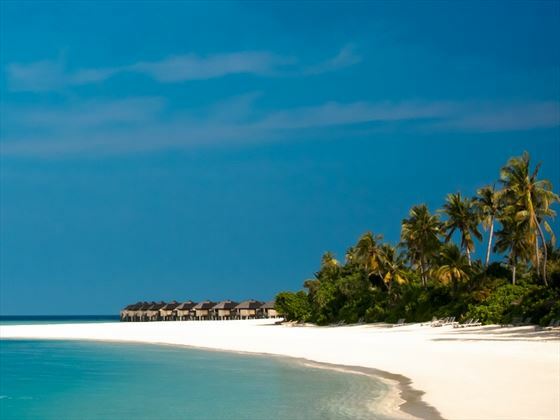 This stunning resort is located on an island in the Noonu Atoll, offering a secluded, luxurious vibe and surrounded by sugary sand beaches. The Sun Siyam Iru Fushi operates +1 hour ahead of Male for daylight saving time, your onwards seaplane to Male Airport will reflect Male time. 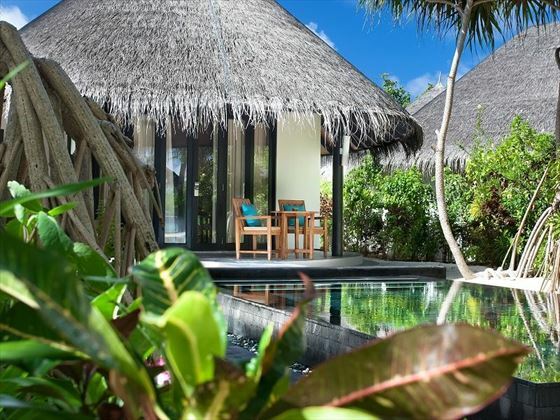 Beach Villa – Cool thatched roof 125 sqm villas featuring beach or garden views, a private terrace and a comfy daybed. Sleeps a maximum three adults and one child, or two adults and two children. 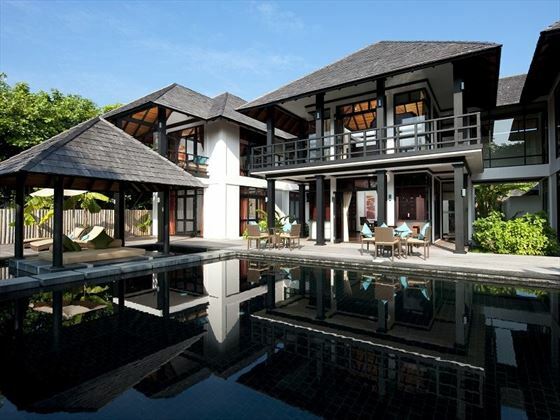 Deluxe Beach Villa with Pool – Ideal for families, these 125 sqm villas feature a lovely sitting area, a black lava stone pool, a daybed, a cosy cabana, and plenty of privacy. Sleeps a maximum of three adults and one child, or two adults and two children. 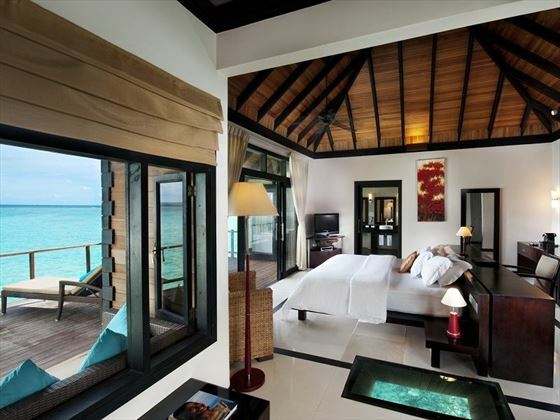 Family Deluxe Beach Villa with Pool – Gorgeous 140sqm villas featuring lagoon and ocean views, an outdoor pool, a cabana, terrace and daybed. Sleeps a maximum of four adults and one children, or two adults and three children. 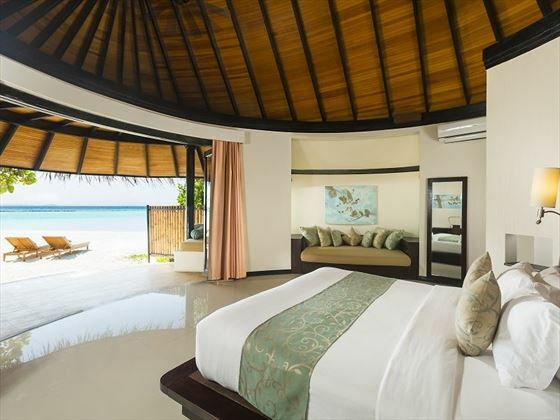 Pool Beach Villa – Offering beautiful views of the gardens and ocean, these 140sqm villas feature an outdoor pool and cabana, a terrace and a daybed. Sleeps a maximum of four adults and one child, or two adults and three children. 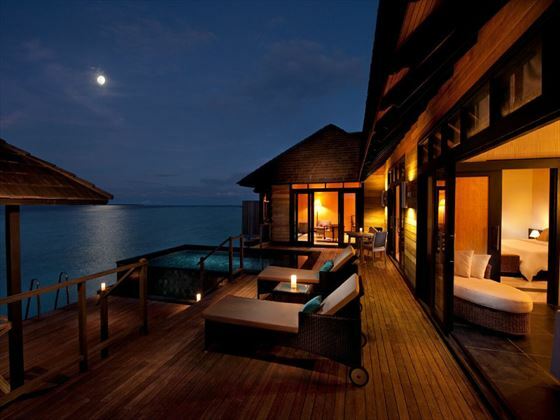 Water Villa – Modern 86sqm villas perched above the lagoon. Features a glass panel floor perfect for sitting and watching tropical fish, plus sunrise views and a private outdoor deck area reaching out into the lagoon. Sleeps a maximum three adults and one child, or two adults and two children. Horizon Water Villa – Spread like palm fronds across the lagoon, these 91 sqm villas are luxurious, featuring a glass panel floor looking down into the water, a Jacuzzi, and an outdoor decking area. Sleeps a maximum three adults and one child, or two adults and two children. 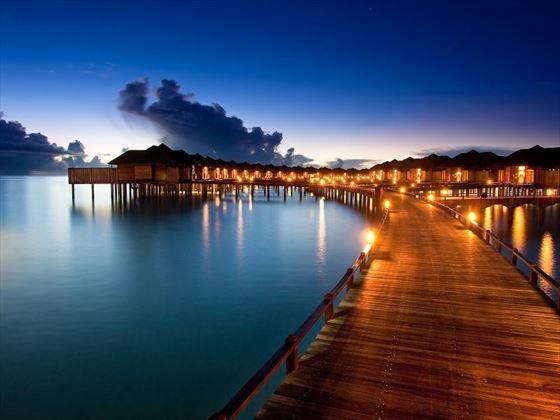 Sunset Horizon Water Villa – With the same amenities as before, with wonderful views of the sun setting in the horizon. 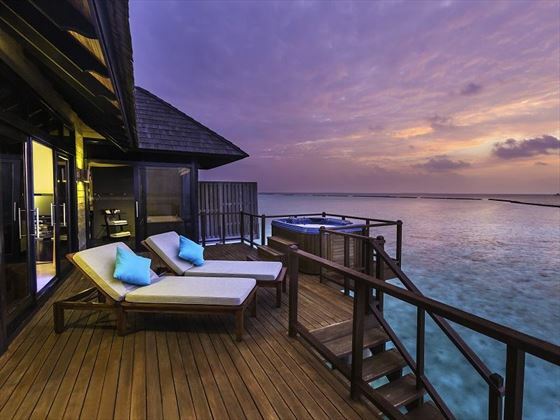 Infinity Water Villa – The most luxurious of the water villas, these 154sqm villas feature a separate living area, a spa bath overlooking the ocean, glass panel floor, and an outdoor decking area with a lava stone pool and dining area. Sleeps a maximum of four adults and one child, or two adults and three children. Hidden Retreat – Perfect for large groups, this 205 sqm retreat features two bedrooms, plus garden views, a butler, large garden, private swimming pool, living room, kitchenette, and a sundeck. Sleeps a maximum of six guests. Aqua Retreat – Light and airy, this 350 sqm retreat features two bedrooms with their own entertainment system and mini bar, plus an infinity pool with Jacuzzi enclaves, an open sun deck spreading out over the lagoon, a dining pavilion, a kitchenette, and a glass floor panel. Sleeps a maximum of six guests. Celebrity Retreat – The biggest and most luxurious, this 600sqm retreat has two floors and three bedrooms, one with a private courtyard, one with a private pool, and one with a private terrace. The downstairs lounge area has a large deck with a swimming pool and over water sala, whilst the upstairs lounge features a wraparound balcony and access to the billiards room. There’s also a private spa room, a kitchenette and dining area, and a butler. Sleeps a maximum of 10 guests. Iru Restaurant – A delicious buffet restaurant open for breakfast and dinner. Open 7am-11am and 6pm-10pm. Islander’s Grill – A gorgeous restaurant serving grilled seafood. Open 12pm-3pm and 7pm-10pm. Trio – A trendy over water Italian restaurant. Open 12pm-3pm and 7pm-10pm. Bamboo – A sumptuous and authentic Vietnamese restaurant. Open 12pm-3pm and 7pm-10pm. Teppaniyaki – A stylish eatery serving Japanese cuisine. Open 12pm-3pm and 7pm-10pm. Flavours – Fine dining French cuisine served over the lagoon. Open 7pm-10pm. The Cellar – The perfect place to enjoy a glass of wine. Open 7pm-10pm. Bubble Lounge – Toast to another restful day with a glass of champagne and sparkling wines. Open 6pm-10pm. Fluid – A cool and trendy family pool bar. Open 8 am -7pm. Taste of India – A colourful restaurant serving traditional Indian cuisine. Open 7.30pm-10pm. Reflections – An adult-only, infinity pool bar. Open 8am-10.30pm. Water’s Edge – A fun bar serving cocktails teamed with great entertainment. Open 8am-1am. Le Cremeria – Serving delightful ice creams and sweets. Open 11 am-10pm. The Spa Café – A wholesome restaurant serving healthy treats. Open 10am-9pm. In Villa Dining – Available 24/7. Destination Dining – Enjoy a romantic dinner for two at any destination on the island. Guests staying on Half Board or Full Board option can enjoy daily buffet dinner at Iru restaurant, or three course dinner per person the following restaurants: Flavours, The Trio, Islander Grill, Bamboo, Sinbad and Taste of India. Full Board lunch is three course meal per per peron served at Bamboo, Sinbad, Islanders Grill, The Trio, Fluid and Reflections. The Spa by Thalgo – This beautiful spa takes inspiration from its surroundings, with a gorgeous open feel and natural light streaming through to create a sense of serenity. Expert therapists will help detox and revitalise you with wonderful traditional massages and holistic Maldivian-inspired rituals. 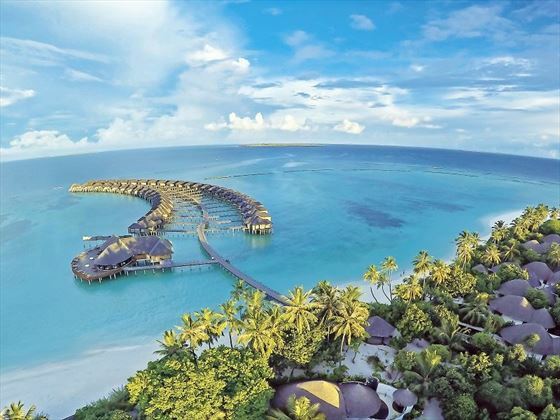 Voted Best Spa Hotel in Maldives at the International Hotel Awards. BREAKFAST (07:00 - 11:00hrs): Breakfast is served in Iru restaurant. DINNER (18:00 - 22:00hrs): All Inclusive dinner is available in Iru Restaurant or a 3 course meal per person from; Islanders Grill, Trio, Bamboo Restaurant, Sinbad, Flavours Restaurant and Taste of India. Daily turn down service with assorted cookies from the second day of arrival. 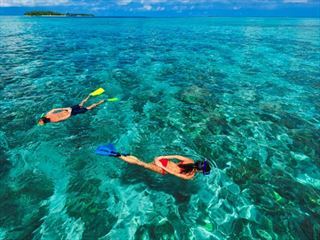 Up to one hours use of Kayaks, Stand-up Padle Boards, Catamaran & Windsurfing. ** All Inclusive drinks are valid from arrival until 12:00hrs on day of departure.